The first thing catches the eye is the beautiful photos of abandoned places in the USA taken by Lasse Hoile. The artist and filmmaker worked already with bands like Porcupine Tree and Opeth. 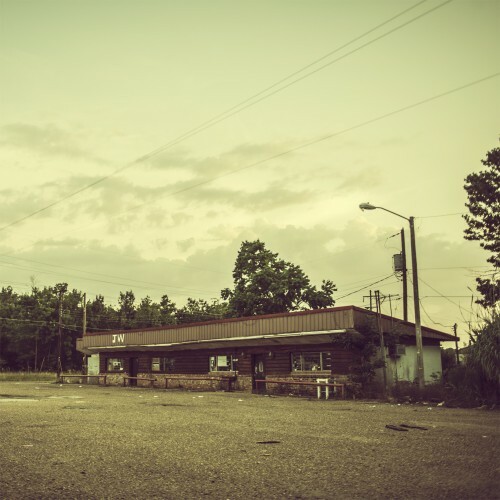 His work this time is scenes of Southern Gothic solitude from America’s Deep South. The stills visualize the fragile Post/Progrock and beautiful vocals of Duncan Attwood in a perfect way. On ‘King Nine’ Blueneck is taking a new step into the direction of electronic music and still combining it with the old sound. Melancholy is well balanced with the scarce beats, piano and guitar climaxes at the right moment. It is amazing to see how the band is still progressing without losing the old edge and energy. “Mutatis” is the best example of this approach. Nine minutes of pure glory is displayed. Some songs still have the dramatic undertones from piano and vocals (such as the opening song “Counting Out”); others are brilliant because of the guitar melodies are reaching the highest rooftops. Subtle beats and electronics are now connecting with the old sound. The title track is heavily driven by this approach. It doesn’t matter if they opt for the classic “rock” instruments or a modern way; what counts is how to built up a song. Catchy phrases and hooks are coming in after the right tension has grown into your skin and the music is bursting out in emotions. I bet if Blueneck strips down every song to acoustic guitars, piano and voice you still have an album that will keeps everyone quiet at the entire length. “Spiderlegs” is already having this approach with beautiful string parts attached. I can analyze the album further and further in depth; it’s hard to stay objective because the boys from Britain have the strength to take you away from this planet to build your own dreamscapes. That’s exactly what they do with these nine songs; none are fillers, all are killers. In this matter the album title ‘King Nine’ fits perfectly; another option could’ve been ‘King First’ because Blueneck once again put itself at the forefront of a perfect balanced mixture between Postrock and Electronic music. I’m curious if they will ever top this record.